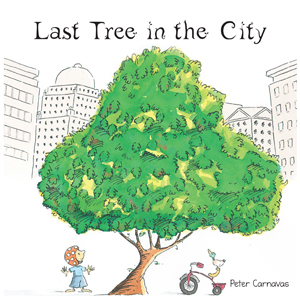 Last Tree in the City is a children's picture book written and illustrated by Peter Carnavas, and published by New Frontier Publishing, 2010. New Frontier have also added value to the book by providing excellent teacher notes. You might remember I reviewed Carnavas' The Important Things and commented,"His illustrations are unusual, minimal, but with so much expression and clever use of colour/no-colour and other details that give us lots to think about." The same is true of Last Tree in the City. The watercolour and black ink illustrations, though simple and of a very direct style, are haunting, and stay with the reader long after the book is finished. Edward is sad after he finds the last tree in the city is no longer standing. After some reflection, he finds a way to make things better. A poignant tale about the environment and the way children relate to its beauty. I like the way our child hero solves his own problem in this story. Such heroes are empowering for kids. He inspires the whole city to follow his lead, resulting in the final, triumphant, colourful and full-of life pages, a far cry from the dull concrete jungle at the start of the book. Last Tree in the City reminds me of a modern fable. It's entertaining but also gives us so much to think about. Hopefully, we will all take something away from this book with which we can make a difference in our own lives. Not only teachers, but parents are looking for quality children's books that have environmental themes they can share with kids. Last Tree in the City is an excellent choice. Follow up activities might include sprouting seeds, collecting cones and fallen leaves in a park or bush walk, gardening, discussing reasons for planting and for clearing - all activities that will make kids more conscious of how our choices impact our environment.